The below image sums up everything that’s wrong with the web design industry. If you don’t quite get what it means, allow me to explain. 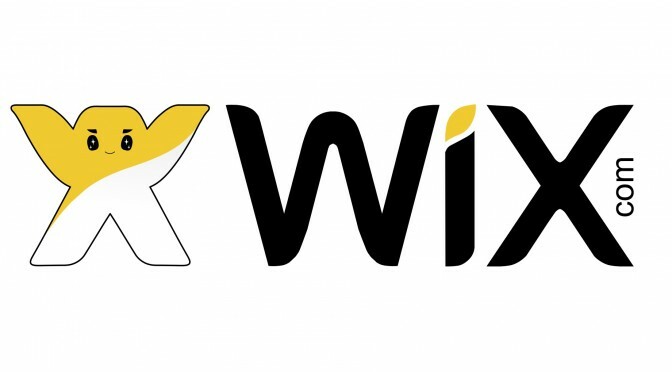 Wix is a free website builder, much like Geocities, MrSite, 20m.com, GBBO or the many other free website builders which came before it. Like the many website builders which came before it, Wix uses a really simple WIZYWIG interface so people with no experience of building websites can, well, build a website. I wrote a post for Engage Web a few years ago about how Bing’s TV advert left a lot to be desired when it came to their search results. Now Bing has released a new campaign, once again attempting to ‘prove’ they’re better than Google. Go on, take the Bing challenge and see for yourself. 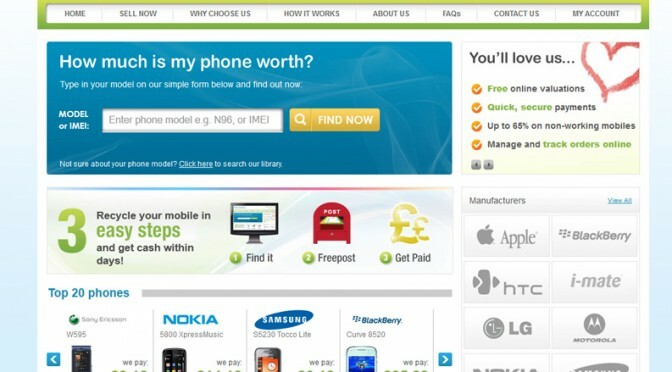 If you’ve ever wanted to recycle your mobile phone, the chances are you’ll have come across a website called Cash4Phones. When you use those phone recycle comparison websites, looking for the best price for your phone, they’re the ones who usually come out on top as offering the most money. Over the years I have received a vast number of guest post, or article exchange request, emails from people. The vast majority of these I just delete but, given the emphasis Google is now placing on identifying poor quality links, I felt I should share one I received today in the hope it stops at least one person from taking up one of these ‘offers’. The below email comes in two parts, as many of these spam requests do, appearing to be an original email I have received and a follow up email. This is a clever trick to make the recipient think they’ve entered into conversation with the sender already. I haven’t, it’s just spam. You will notice the name of the sender is Indian, and the email address used is a free one at Gmail. The better educated among you will also notice the grammar in the email is poor. This always surprises me actually. If you’re going to the trouble of sending out thousands of spam emails looking for links on websites, you could at least ensure your own email is written properly. A little effort up from would save a lot of wasted effort in sending the emails. But anyway, I’m glad they don’t as it makes it even more obvious to spot. You can also see the sender has requested a link on CSAhell.com, but the email didn’t come through the contact form. No, it came through the info@ email address. This again is a red flag because it shows someone has sent that email on spec to info@, hoping it exists and someone will receive it. They haven’t ‘gone through the site’ at all, and I’m sure they don’t ‘appreciate your hard work’. Please, I implore you, if you receive emails such as this don’t reply and don’t take them up on it; just delete them. It won’t help your website’s rankings, it’ll have the opposite effect. I hope you are doing well. I believe you receive my previous mail. For the time being am sending few sites of mine. Please send me your feedback as soon as possible so that I can start writing article which will be suitable for your site ” www.csahell.com “. I am Lorena member of financial domains on debt, loan, mortgage and other various finance topics. Today, while searching for a suitable blog, I just come across yours. I have gone through it and found it very resourceful. I must appreciate your hard work. It will be my pleasure if I can contribute some quality content for your site ” www.csahell.com ” each of my content will be analytical and relevant . If you wish, you can suggest few topics on which you would like me to write. Not only that, I will give you the total right to edit the article and modify it as per your needs. 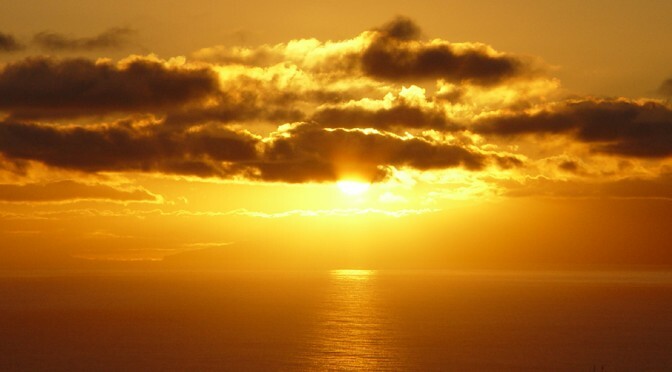 In return, I would gladly place your articles in my websites. This mutual content exchange will help our websites to get more targeted visitors. If, like me, you’ve been a member of eBay for many years (13 years for me) you’ll know the website has gone through a few changes. One of the changes I’m not so keen on is the loss of the ability for sellers to leave negative feedback for bidders who never pay. If a bidder proves to be an utter timewaster now you can report them as a non paying bidder, where you’ll receive a credit for the final listing fee, and that’s supposed to be recorded on their account as a black mark – restricting their ability to bid. But does it? I’ve just had two non-paying bidders for items and, after checking their feedback, have seen many sellers who have left them ‘positive feedback’ (as that’s all you can leave) but with a decidedly negative comment on how they haven’t paid. eBay doesn’t want you actually doing this, but some sellers are so angry they’ve felt compelled to do it. Today I contacted eBay’s online support team to find out what a seller can do to ensure these timewasters don’t bid on their listings when they have no intention of paying, and to find out exactly how many times a buyer can be a non-paying bidder before they’re banned. eBay does actually have a good system to stop timewasters from even bidding on your items – it’s just well hidden. Read on and you’ll see how to do this. I’ve also linked to the two non-paying bidders for you – so you can block them yourself. I’d do that if I were you. Welcome to eBay Live Help, my name is Elsie. How may I be of assistance? Hi – why has eBay removed the ability to leave negative feedback for buyers? This buyer, and another I reported today, haven’t paid or made any attempt to communicate. I can see other sellers have left ‘positive’ feedback for both of them with ‘non-paying bidder’ warnings in the comment, which you don’t actually allow – so what protection to do sellers have against timewasters such as this? I’d be happy to help you out with leaving feedback to buyers. Please stay connected while I check this for you. OK – the non-paying bidders, who I can see from their feedback have done this before, are cloudedruby and grumpykat22 – they should be warned or banned from using eBay. Thank you for staying connected. As sellers like you will not be able to leave negative feedback to buyers, our Trust and Safety team keeps a track of such buyers & their bidding activities, and when we discover unethical bidding practices, such cases may also lead to suspensions, restrictions on the buyer’s account. The system keeps track of number of unpaid item recorded on a buyer’s account. Multiple records of this can cause them restrictions to continue with their buying activities. How many is ‘multiple’? I can see from the feedback both of these buyers have done this before, more than once, and that’s just from the sellers who have left positive feedback with a negative comment. How many times can these people bid on items, win auctions and never pay? They’re wasting my time and yours if they’re bidding on items they have no intention of every paying for. We also added protection for sellers aside from the usual filing of cases against buyers by removal of negative and neutral Feedback from suspended buyers and you can report to us if you are dealing with fraudulent buyers so we can take appropriate actions towards them. How many times can bidders, such as grumpykat22, win auctions they don’t intend to pay for before you ban them? I know how this concerns you Darren. To prevent non-paying buyers from bidding on your listing, I would advise that you set up your Buyer Requirements. This tool enables sellers like you to prevent or limit the buyers from bidding or buying their items if certain criteria are not met. In order to resolve your issue, I will connect you with our UK Trust and Safety Team now. Would that be fine? What are the buyer requirements? I have blocked these two bidders. Buyer requirements is a tool wherein you can limit the buyers from bidding or purchasing on your items when some criterias are not met. 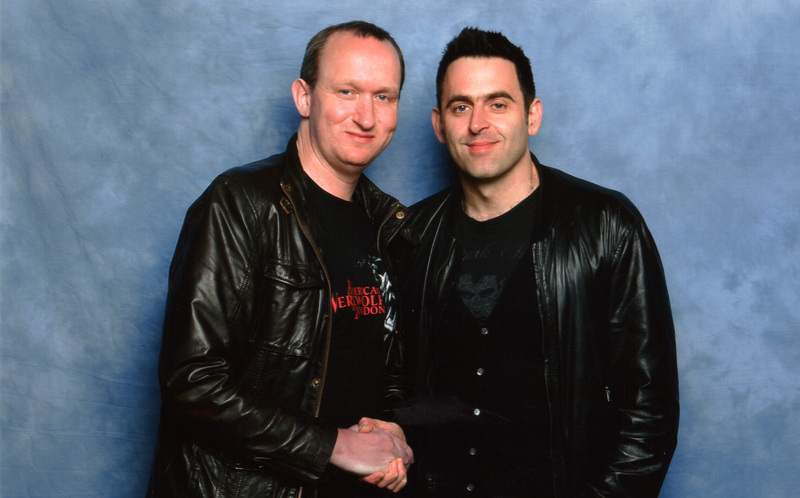 Ah – found that. That’s a good idea. Does it show the buyers they have been blocked and tell them why? Yes, buyers will receive a note that they’re unable to place a bid or purchase an item from you and they will be able to see the reason. Excellent, I like that. I’ve set that up now to block people with 2 unpaid notices in the last month. That should sort the problem out. I still want to know how many times they can do this before they are banned. That’s great Darren. Non-paying buyers will only be restricted on purchasing items on the site if they received more than 2 unpaid item record on their account. Surely grumpykat22 has more than that already? The feedback certainly suggests so. I understnad your concern about buyer grumpykat22. Once they received more thn 2 Unpaid item record, they will be restricted on purchasing items. In fact I can see loads of unpaid warnings on their feedback – they’ve done this many times since joining in January this year. Seems they bid on items then decide whether they want them. Many sellers have gone through the same thing I have. I have to leave the office sadly – but I would like an email about it if that’s possible. It looks like this buyer has got away with not paying since joining eBay. I realise how this concerns you Darren. I will escalate this case to our relevant team in order for this to be looked into as soon as possible. Please escalate it, thanks. I look forward to hearing from someone. Nope, that’s great thanks. You’ve been very helpful. Thank you for contacting eBay Live Help, have a good evening. When I hear back from eBay regarding this I’ll post the response. The bidder grumpykat22 has received loads of negative comments yet they’re still happily bidding away on listings without paying. Will they be banned? Does eBay even ban bidders anymore. I’ll try and find out. 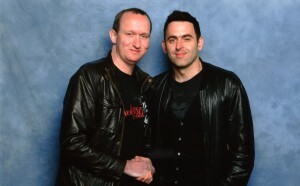 A few weeks ago I met current snooker world champion, and legend, Ronnie O’Sullivan at Collectormania in Milton Keynes. It was a quick meeting, but one of the few things I’ll have done at a convention that my dad would actually be interested in. A week or so after that we finished the following Infographic featuring Ronnie – I wonder how he’d feel about his likeness. He’s come off a lot better than Mark Williams, he looks like he’s answered the eternal question of where all the pies have gone. 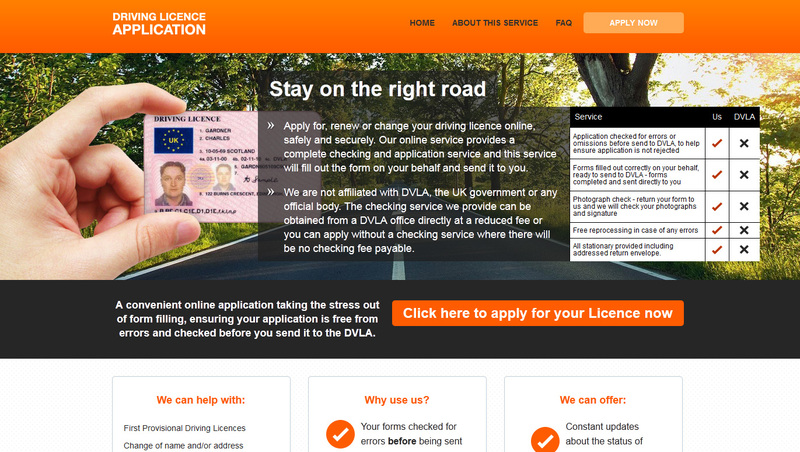 A friend of mine emailed this week asking if I heard of the website drivinglicence.uk.com as they had just paid them for, what they believed to be, a driving licence for their daughter. 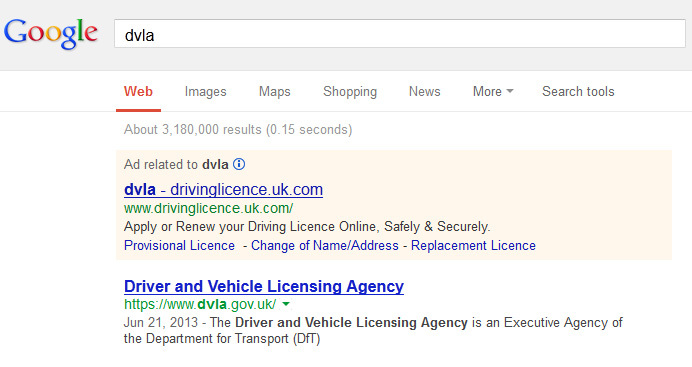 They Googled DVLA, as you would, and found this website at the top of the search results – the sponsored search results. They filled in the form, paid their money and waited patiently for the driving licence – only to be sent a form which they then needed to forward onto the DVLA and pay AGAIN for the driving licence they thought they had already paid for. In effect they have to pay twice for the driving licence, all because they fell for this awful trick. The sad truth is most people who don’t work online don’t know the difference between Google’s organic results and the paid results, which is where sites such as this manage to fool people. Where the DVLA website ranks #1 in Google for a search on DVLA (as it should) and it also ranks #1 for many associated search terms, it’s only sites like drivinglicence.uk.com which pay for sponsored listings and thus ‘appear’ to rank #1 to people who aren’t quite so Internet savvy. In good faith these people will click on the first result and pay their money for what they believe is an application for a driving licence, when what they’re really paying for is a ‘checking service’, one which isn’t needed in the first place. The website simply checks the data you’ve entered to make sure you’ve filled in the right boxes, and charges you for the privilege. So you’re paying for nothing. So how is this even legal? The checking service we provide can be obtained from a DVLA office directly at a reduced fee or you can apply without a checking service where there will be no checking fee payable. It’s this statement which keeps this website on the side of the law, but a statement many people won’t read or even notice. They’ll simply see the site ranked at the top of Google, click ‘apply’ and pay their money, as all of these people have done, and these people. As you can see from the comments on the site, many have telephoned to make complaints to drivinglicence.uk.com (as my friend did) but few receive a satisfactory answer, with some even being cut off from the call. The company knows it is conning people who believe they’re paying to renew their licence, and it doesn’t care. There are many website such as this charging people for services which are otherwise free, such as the many PPI claims websites and companies charging people a percentage of their winnings for simply sending a letter – a letter you can send yourself for free. They’re parasites sucking money from people who are fooled by their tricks. My advice is to avoid websites such as this and ensure, before you enter any payment details, you’re on the official site for whatever it is you’re trying to do and you carefully read what it is you’re going to get. Under the Distance Selling Regulations you can demand your money back from scammers such as these, but they don’t all play by the rules or the law, so you may find that’s a dead end. John Chow John Chow is the man when it comes to making money online, and spending it!